The new Book Rover will be on display in front of the Columbia Public Library Wednesday, April 17, so stop by and see it up close from 5-6 p.m., rain or shine. 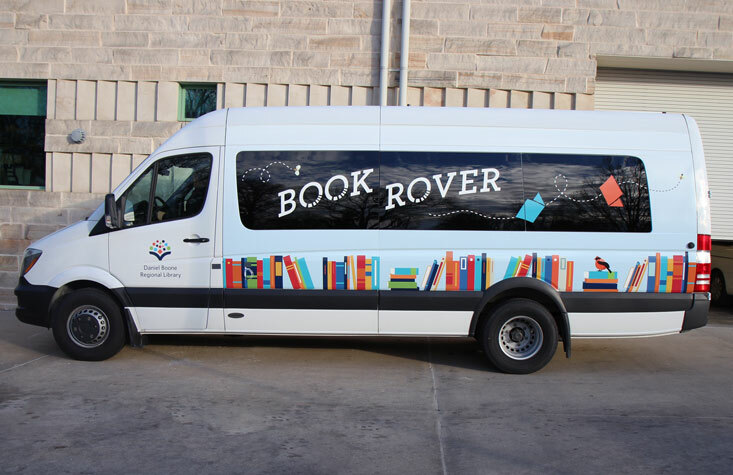 There will be a ribbon-cutting at 5:15 p.m.
Like the library’s other two bookmobiles, the Book Rover is fitted out with library materials to take to community centers and events in Mid-Missouri. Since it is a smaller vehicle, it will be better able to visit a broader number of locations, which includes licensed child care centers in Ashland, Columbia and Fulton. The new specialized van was paid for solely with donor funds made via the Daniel Boone Regional Library Foundation. The library thanks the many businesses, community groups and individuals who donated to support early childhood literacy by funding the purchase of the Book Rover. Book Rover donors include the Monica Creighton Estate, the Lora L. and Martin N. Kelley Family Foundation, Veterans United, Boone County Community Trust, Boone Electric Cooperative Community Trust, Central Bank of Boone County, The Callaway Bank, Landmark Bank, Missouri Employers Mutual, Officer Mechanical, Williams Keepers and 228 individuals and community groups.